The new year is seeing a new way for Arlington County residents to obtain Capital Bikeshare memberships: with cash. The pilot program, called Arlington Resident Cash Membership, begins this week. It is intended to bring the membership service to the “unbanked” residents of the county. It is believed that one reason for the poor representation of minority riders in bikeshare programs has been the credit- or debit-card requirement for membership, a fairly ubiquitous requirement across all U.S. bikeshare systems. With the cost of a Bikeshare bicycle at $1,200 each, the credit/debit requirement is intended to guard against equipment loss. The unfortunate side-effect of this requirement has been the way it has kept those without proper credit – the unbanked – out of the system. Arlington’s program will be the first in the U.S. to allow bikeshare memberships on a cash basis. It is hoped that this change will allow Capital Bikeshare ridership demographics, in Arlington County at least, to more closely reflect those of the region it serves. The Cash Membership program, unlike prior outreach programs aimed at addressing inequities in Bikeshare usage, will operate simply. It will allow an unbanked Arlingtonian, with proof of county residency, to obtain a Capital Bikeshare membership at any of the county’s five Commuter Store locations without providing a credit or debit card. With as little as $16 dollars on hand, an Arlington resident can leave the Commuter Store with an active Capital Bikeshare fob. The resident will then be able to check out any of the 2,500 bikes in the regional system. Cash Membership users will be notified when their accounts reach $2. Then they may replenish their accounts with money to keep their memberships active. ACCS will vouch for residents signing up via the cash program, insuring any losses that may result. 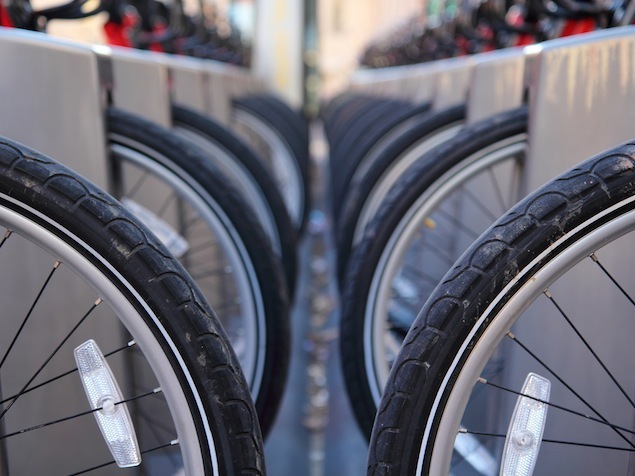 Paul DeMaio, a bikeshare consultant for Arlington County and Mobility Lab contributor, said that Capital Bikeshare has lost just 26 bicycles in its four years of operation and more than nine million Bikeshare trips. While not targeting any particular neighborhoods in Arlington per se, the county will produce brochures in English and Spanish educating the public about the new program. These materials will be distributed to the county’s libraries and community centers, as well as its Commuter Stores. While only available in Arlington County, Hamilton said he hopes other Capital Bikeshare partner jurisdictions – Alexandria, the District, and Montgomery County – will follow suit. “We know they’re watching,” Hamilton said.